Been playing around with track. Nothing complex, surprising how much can be fitted in a small space. Alternative mouse house either end. I would probably use front line as main line when attached to other modules, but both back and front will be wired so it can be changed around easily. I would not expect much shunting at exhibitions but always an option. 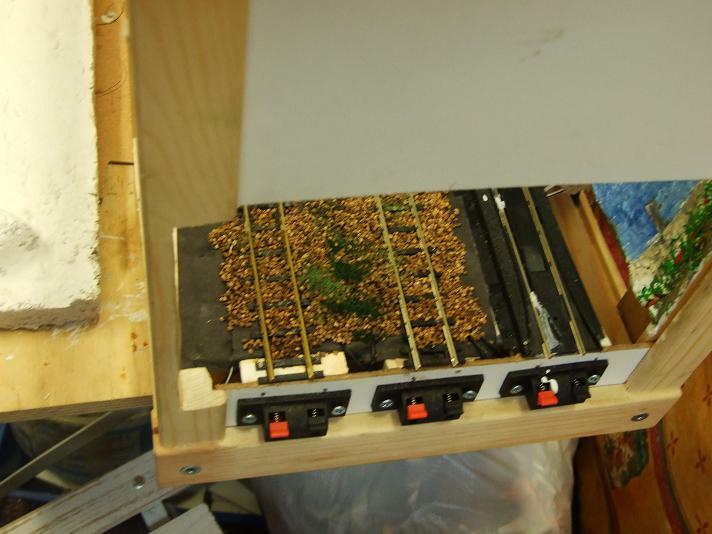 The middle siding will not have a mousehole though. For module no. 2, which will be a Channel crossing (French side only) will use removable top as backing so it can be fitted either end. Depending which end it is fitted, will change the route though module 1. In effect it will be a reverse curve for route 3 to 2. The upper level in box 2 will have a G9 line, with tipper wagons unloading into bigger wagns on bottom track. 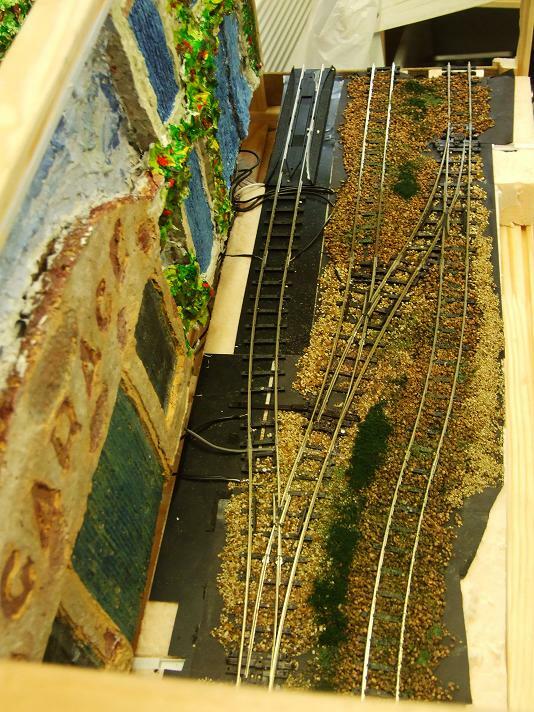 At the moment it is planned to connect this to middle line on module 1, so sidings can be operated separately. I have built some wagons based on Fleischmann tipper body on N gauge chassis (very top heavy) but might use Minitrix ones instead. I think the smaller tippers would be more appopriate as hand pushed wagons in vineyard itself, but small loco will be used to push loaded ones to tipper. 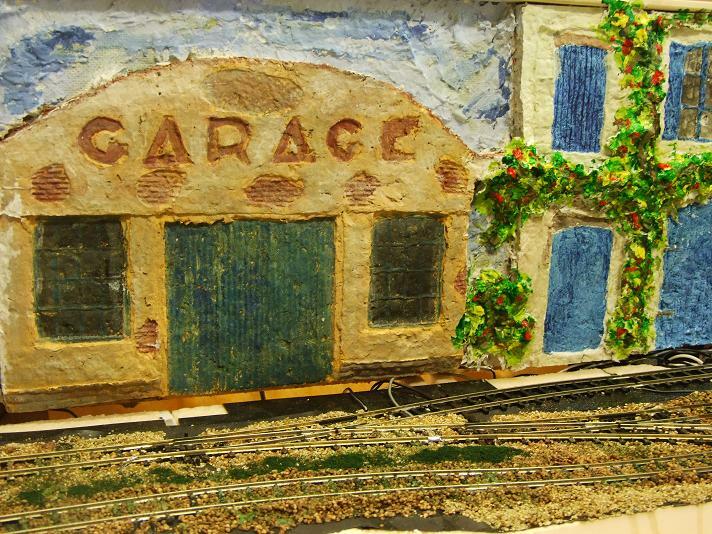 The garage I have moulded before, but also built in other scales. It is a classic French Art Deco design, with writing in an unknown but classic font. I have thought up a sort of history for bridge. In 1945 there was a lot of construction material around on coast, and some army engineers thought it a good idea (after a night in local bar) to build a bridge across the channel. One had interests in miniature railways and had gwown up just over the other side near to Dymchurch so was familiar with 15in gauge. Not too sure how happy the naval chaps were, as there was a lot of shipping traffic through channel, so some form of movable bridge section(s) was conceived. Train trains would not be that regular, so bridge would be open to sea traffic most of the time. I think there was also some ideas for transporting illicit items on the trains, and as the bridge sections could be floated in as required, then the channel could operate as normal most of the time. 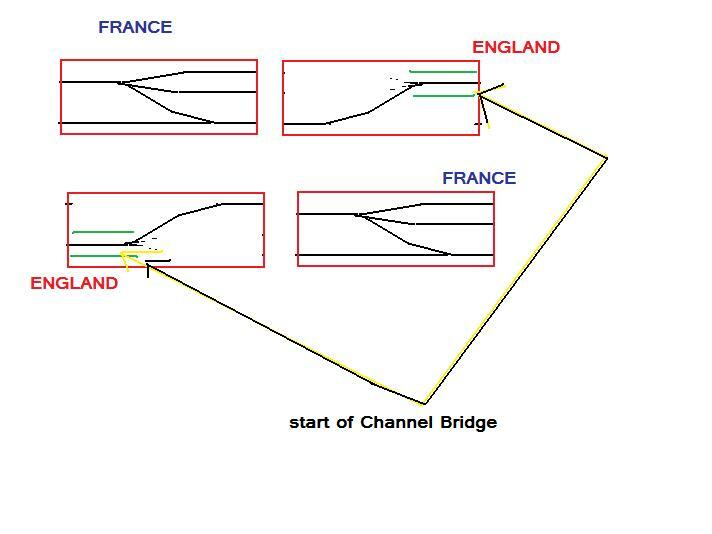 Given some of the crazy engineering ideas that were proposed, and in some cased built and tried out, such an idea for a Trans-Channel bridge might not be such a crazy idea. I just googled Mulbery harbour and was surprised to find there were over 10 miles of section in British part, so not so crazy to have some type of floating bridge across Channel. I have also checked and this module can easily be accessed/operated at higher level, so would go on second layer easily. Wired up 3rd module (which is actually module 2) tonight. Tested OK, after replacing faultt speaker connector. Track not ballasted yet and also needs properly fixing down at ends, but connected up to module 1, which is ballasted (a bit much in places). First time I have run my Gn15 locos for a couple of years. They are all DCC fitted as I originally intended to run DCC, but found they ran better on non DCC controller at exhibition. Suspect it was more to do with poor connections between modules, so the wire links on APA modules will help. Found most locos a bit sluggish at first. This is partly due to long time not used, and partly because it sometimes takes longer for DCC fitted locos to start. My top heavy stuff was a bit wobbly , and ballast did not help. The best loco was the Bachmann GE70 based one, which is much heavier with lower cetre of gravity. I remember this did most of the work at last exhibition it attended. As a result i have bought another one on eBay, and am watch some others. Unfortunately time ran out at club, so will have to wait till next year(at least that is only next Wednesday ) to do some more work. Track condition will have to be something I am more careful with than on my other layouts as it will have to be suitable for locos from other people to run across. Most of my Gn15 units are Bachmann Thomas type based. That was what was around at the time I built them. Problem is not the chassis, but the high centre of gravity. The inclusion of DCC does not help either. Hopefully as I run things more it will run better. The UE units were not around in large quantities (ie cheap), and these would probably run better. I haven't graphited the rails yet, which will help for most of my units, but the Tuk Tuks are single axle drive (for some reason I removed the connecting rods on the Percy type loco). It would have been better to have used Hornby units in this case, but I was trying to only use DCC installed locos at the time. The 'mainline' will be made to run for everything, wheras the sidings can be restricted. One difference my modules have is the inclusion of pointwork, whereas most of the other modules I have seen are 'pointless'. One reason I prefer roundy layouts is that locos can be properly run in, and kept running better. 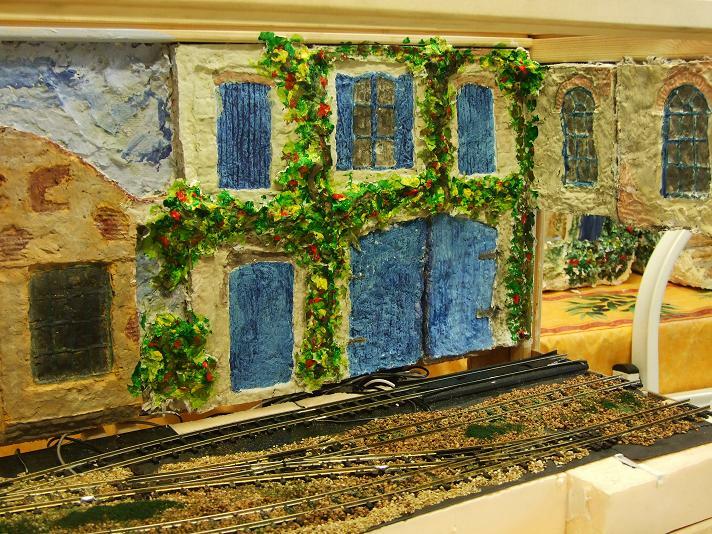 I will probably rebuilt my other Gn15 layout as a single 3ft by 2ft layout, incorporating the buildings from the old layout. This way I can have something which can be up and running faster, but also have the modular APA one to run with others, and also connect to the roundy one. Fitted all three modules together tonight. Ballast on 3rd module had dried so it was a good chance to test run. Apart from a bit of dirty track, and some excess ballast, it all ran well. Used my Bachmann GE70 based loco as its best runner, then tried others out. Once rail was clean and clear, only problem is dirty wheels. I might remove some of the DCC chips as some units are still a bit sticky, in particular my 2CV Eurostar train. If I remember I will take my camera down to club tomorrow. Next job is to fix up rods to points, then finish off scenery . Need some better pieces of track to connect modules, plus some screens to cover joins. 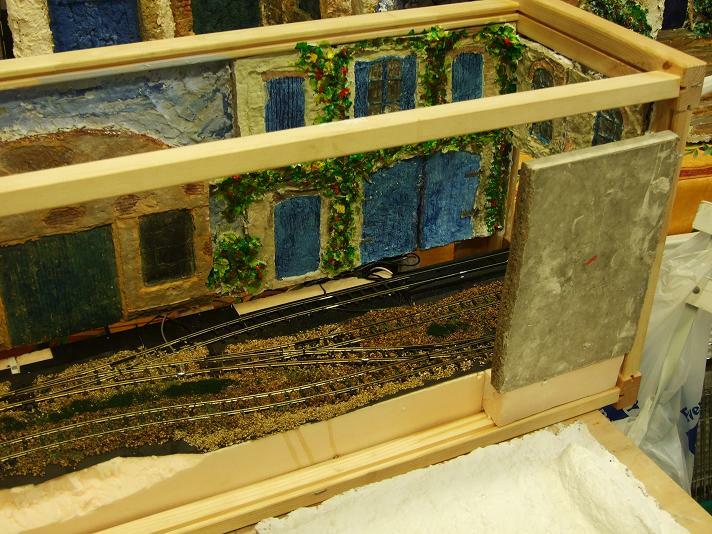 Also a backscene for channel bridge section. 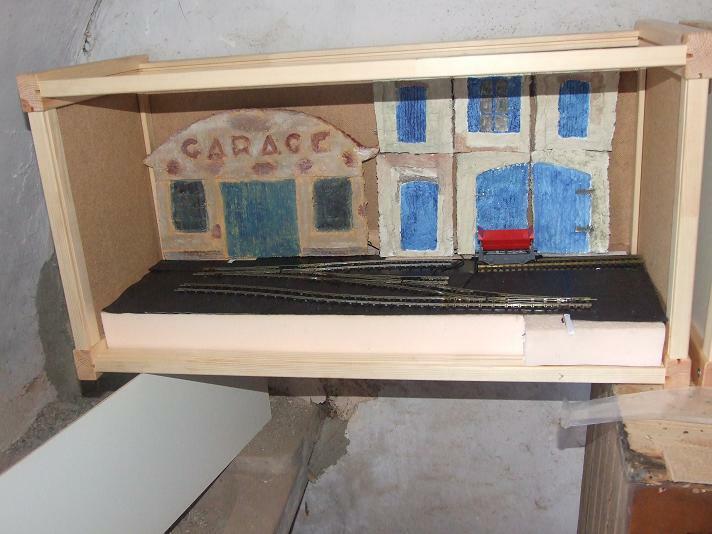 For my own use I will also need some type of fiddle yard, but that will only need some track on a piece of insulation polystyene. Took two modules down to clubrooms to test tonight. Works OK, shubbery needed cutting back, and I had a rethink on the hinged tops. I had painted some of the tops, but these did not look right so I replaced them with some unpainted ones, a lot cleaner looking. I might have to do some mods depending on how much light there is at Rainhill. 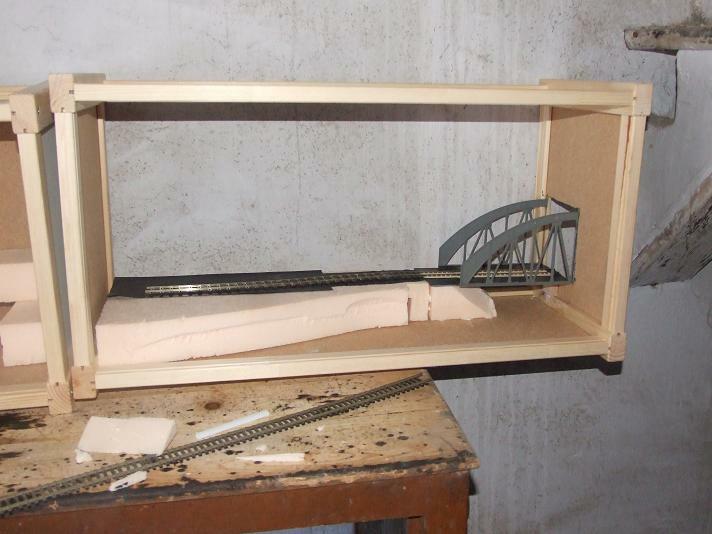 Module 3 (the Bridge), just needs a bit of paint on backscene, and top fitted. 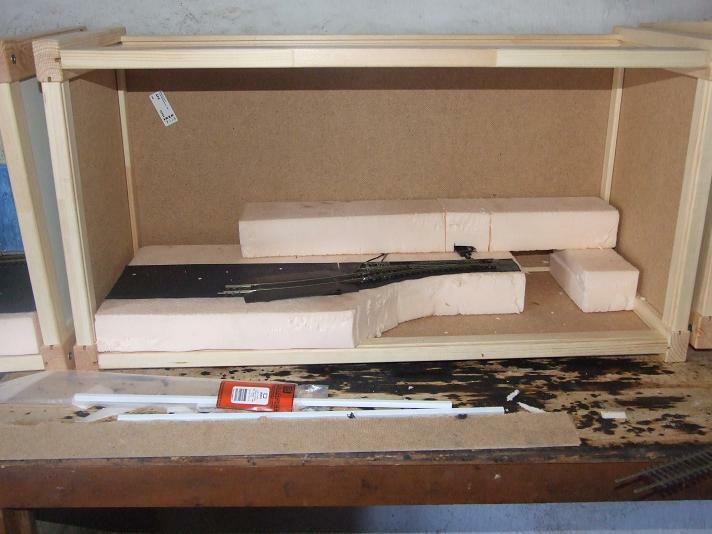 Fiddle yard box is just a plain APA box with end opened up, and pink polystyrene on base. I will fit temporary track on the day. Built to KISS standards, which have proved to be best way before. I haven't taken any photos recently, so all will be revealed on the day. Hello dear friend, Simon, i like all the work made on the Apa modules, very interesting, thanks for sharing the techniques and ideas, i will keep on following, my best regards, have a nice day. my only regret is that I had not thought up idea of using 3 boxes to make a circle then. But then it would not have been a baguette . If the live steam indoor Kent & North Wales Light Railway can connect SE England with ... err .... North Wales (also with bridges (four), then the 21 miles or so of English Channel has to be technically feasible. The K&NWLR (now with added Gn15) salutes this echo of the engineering genius of Brunel (son of French immigrant)! one of my boxes will be crossing the Channel next week, under not over. On way to RAMMA for the weekend. I originally designed it so two trains could operate, which allows me to have shuttle on front line and shunting at the back. The other 2 boxes are a bit superfluous at the moment and have thought of converting to 1/35. 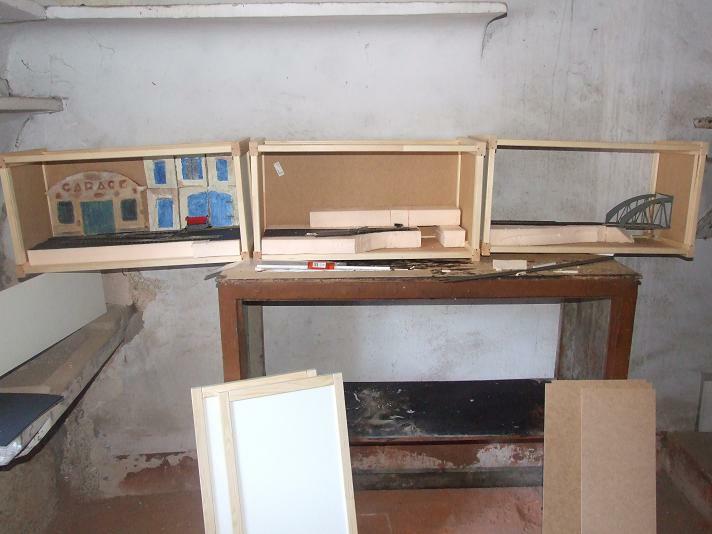 This would mainly involve changing buildings slightly(doors etc) , but there are a couple of larger scale items(boat) which would have to be taken out. Still would want a circular layout so more boxes required, but not too many to fit in car.2 extra would be absolute maximum. Other option is to build 2 more Gn15 modules, curved so oval can be created. Layout all packed up and ready to got to RAMMA this weekend. Looking forward to it but a bit apprehensive about what happens when I get there. Apart from the Gn15 layout and stock, I am also taking some of my 3D printed stuff to show anyone interested.